April, 2012 - The HOMES Act, H.R. 4230, recently introduced by Rep. McKinley (R- WV) and (D-VT) would incentivize homeowners to undertake comprehensive energy-saving improvements. By creating a rebate program, the legislation would help homeowners afford specific home energy efficiency retrofits, including a combination of: better windows; insulation; heating equipment, etc. that lower energy consumption and cost. The bill would authorize $500 million for the rebates each year from 2013 to 2016. Included are wood and pellet stoves that emit 3.0 grams an hour or less and boilers that emit .07 lbs per million BTU. The HOMES act, which stands for Home Owner Managing Energy Savings, is a departure from tax credits or rebates for particular appliances that the IRS used and Home Star would have used. Instead it is based on performance and requires a professional energy audit to show how much energy is saved. It starts at $2,000 for homeowners who can demonstrate 20 percent savings and goes up incrementally to $8,000 or 50 percent of the project's cost, whichever is less. The emissions limits alone would include a vast majority of pellet stoves (90% or 178 out of 199 pellet stoves on the Washington state list are 3.0 or under, ). For wood stoves, it would include less than half of existing models (40% or 231 out of 572 wood stoves on the Washington State list are 3.0 or under.) For outdoor wood boilers, there are four out of 30 boilers (two wood and two pellet) that would qualify for the emissions threshold on the EPA's list of qualified outdoor boilers. As of Thursday, July 29, it appears that Home Star will be passed this year as part of Senator Reid's energy bill. Reid released his bill this week containing the biomass provisions that were passed in the House. When the Democrats gave up on comprehensive climate change legislation, Senate Majority Leader Reid announced a very scaled-down package of bills that includes Home Star, incentives for vehicles powered by natural gas, and safeguards for offshore drilling. Absent from the package were limits on carbon dioxide or renewable electricity requirements for utilities that add solar and wind power to their portfolios. The Alliance for Green Heat was the primary group responsible for the Home Star language. Other groups scaled back the proposed language by requiring that wood stoves have a change-out and other provisions. While some key industry actors supported change-outs for wood and pellet stoves, the Alliance-with the help of BTEC-kept pellet stoves as an eligible option for all American homes. The Home Star bill will give a $1,000 rebate for stoves that meet 75% of a home's heating needs and emit less than 3 grams of particulates per hour. For a wood stove to qualify, the homeowner has to trade in an existing wood stove, but a pellet stove qualifies without any change-out requirement. A lower $500 rebate applies to stoves that cannot meet 75% of a home's heating needs. Boilers are eligible for the $1,000 rebate as well as long as they fulfill 80% of home heating needs. Only some of the EPA-qualified Phase II outdoor boilers will qualify, based on the third party efficiency numbers. The Home Star rebate cannot be combined with the federal $1,500 tax credit, but anyone who has already used that tax credit can still get the Home Star rebate. It is expected that the package will be approved in the next week before the August recess, and President Obama has indicated his willingness to sign it. The HVAC and related tax incentives in section 25C that give $1,500 credit for 75% efficient biomass stoves is set to expire at the end of the year, but it could be extended in the lame duck session between the November elections and the end of the year. If this occurs, homeowners may be able to choose between the $1,000 rebate or the $1,500 tax credit. Given the choice, those who can afford to wait until the following April and who have a tax liability could do better with the tax credit. Those who need the discount right away or may not owe taxes in April could take the rebate. If the tax credit does not get extended, the Home Star rebates will be the only national incentive for biomass appliances in 2011. (bb) has particulate emissions of less than 3.0 grams per hour for wood stoves or pellet stoves, and less than 0.32 lbs per million BTU for outdoor boilers and furnaces. 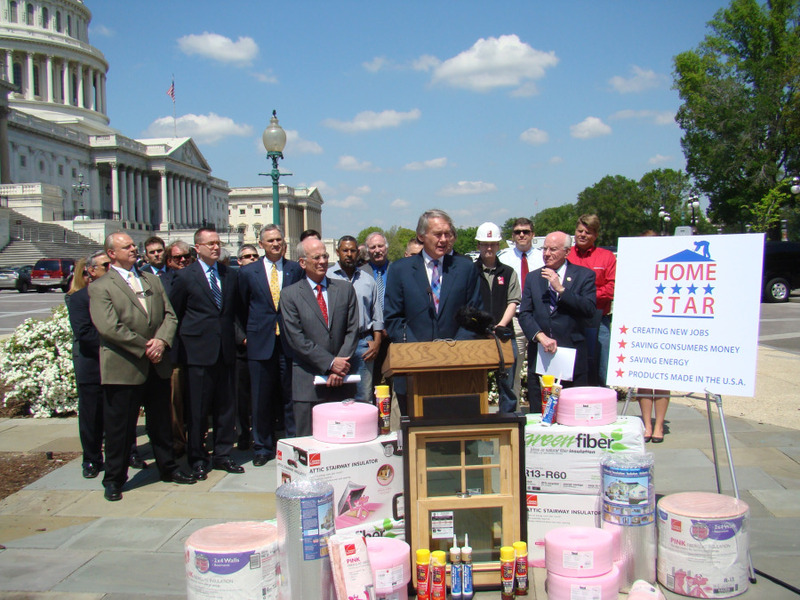 May 27, 2010 - Senator Bingaman introduced Home Star in the Senate on Thursday, May 27, largely adopting the House language on biomass appliances. The bill took the strict emissions standards from the House bill that requires stove to emit no more than 3 grams per hour. The Senate also adopted the lower $500 rebate for stoves that can't heat 75% of the home. For stoves or boilers that can meet 75% of the homes heating needs, the Senate raised the rebate level from $1,000 to $1,500. However, the Senate version doesn't allow "double dipping" with the federal 30% tax credit up to $1,500. Under the House plan, the rebate maxes out at $1,000 but homeowners can also claim the $1,500 tax credit. For the first year of the program, consumers can receive 50% up to $1500 in "point?of?sale" rebates for qualified biomass appliances and installation costs. Eligible measures include pellet stoves, wood stoves if you are changing out an existing wood stove, and wood and pellet boilers. Boilers must be 80% efficient which is likely to include higher performance boilers. Most EPA qualified Phase 2 boilers, for example, are at least 80% efficient, but some aren't and would not be eligible. The bill was introduced by Senator Jeff Bingaman of New Mexico and a bipartisan group of co-sponsors including Graham (R-SC), Snowe (R-ME), Merkeley (D-OR), Brown (R-MA), Stabenow (D-MI), Sanders (I-VT), Dodd (D-CT), Cantwell (D-WA) and many others. The bill is expected to be approved by the Senate but funds must be identified to pay for the 6 billion dollar program. It is most likely to be added to a jobs bill or some other larger bill but if the right sort of funds are found to pay for Home Star, it could be enacted as a stand-alone bill. May 6, 2010 - By a vote of 246 to 161 the House of Representatives today voted to approve the Home Star Energy Retrofit Act of 2010 (H.R. 5019), which authorizes creation of a national energy retrofit program for American homeowners. The vote marks a significant milestone in the progress of the bipartisan HOME STAR legislation, although it's important to note that the authorization bill passed today must be matched by the Senate, and followed up with an appropriation bill to allocate funds for the $6 billion program. Introduced by Rep. Peter Welch of Vermont, Home Star will provide rebates on energy efficiency measures, including high efficiency biomass heaters. It will provide $1,000 point of sale rebate for biomass stoves and boilers that meet 75% of the homes heating needs. A lower $500 rebate will be available for wood or pellet stoves for space heating and do not have ability to heat most of the home. For both levels of rebates, wood stoves are required to replace an existing wood stove, making this bill the first national wood stove change-out bill. Home Star will also be the first national rebate program for biomass appliances ever and it establishes a strict emission threshold of 3 grams an hour both wood and pellet stoves, well below the EPA's 7.5 grams per hour limit. The biomass provisions were subject to intensive debates and negotiations around a number of points, including whether rebates for pellet stoves would also only be available for people who currently owned a wood or pellet stove. The Alliance for Green Heat, which has been advising the bill's drafters from the start set aside our advisory role and aggressively tried to convince all stakeholders that pellet stoves should be available to first time buyers. Several environmental groups who were integral to the coalition were hesitant but a last minute agreement was reached. American Council for an Energy Efficient Economy (ACEEE) played a vital mediating role through the entire process to ensure standards for biomass appliances paralleled the requirements for high efficiency oil and gas furnaces. As it stands now, in both the House and Senate bills, boilers must be 80% efficient at the lower heating value (LHV) as accredited by an independent laboratory recognized by the EPA, unlike the federal 30% tax credit. An 80% LHV threshold would allow seven of the twelve Phase 2 qualified hydronic heaters to be eligible, including 4 that use stick wood and 3 that use pellets. While this establishes an even higher bar that Phase 2, it also allows the rebate to go to Phase 2 boilers that will be installed in states that have no set-back or stack height limits for hydronic heaters. Equally important to the efficiency threshold, is what test is allowed to establish efficiency. Home Star almost required all boilers to be tested using Method 28, which was developed for outdoor hydronic heaters that are designed to cycle on and off and burn at lower temperatures. The cleanest indoor boilers are designed to run at high temperatures and do not necessarily perform well if they have to use a test designed by hydronic heaters. One significant implication of the 3.0 gram per hour for a wood stove to replace an existing wood stove is that to get the full $1,000 rebate, it must be able to meet 75% of the homes heating needs. In general, this requirement will favor smaller homes and larger stoves. For larger capacity stoves to be less than 3.0 grams an hour they will be more likely to be catalytic models, which may help begin a process of rejuvenating the catalytic stove lines. April 17, 2010 - Rep. Peter Welch (D-VT) introduced the Home Star bill known as "Cash for Caulkers," in the House of Representatives that include high efficiency wood and pellet stoves and boilers. To be eligible for the $1,000 rebate, stoves need to be 75% efficient and boilers 80% efficient, be third party tested and meet several other requirements. "Wood and pellet stoves are now being brought into mainstream appliance standards where they belong," sad John Ackerly, President of the Alliance for Green Heat, an independent non-profit that promotes cleaner and more efficient wood heat. "Inclusion in the Home Star program will help tens of thousands of low and middle-income families who rely on wood and pellets to lower their fossil fuel heating bills," said Mr. Ackerly. The Home Star program sets a strict standard, as it does with other appliances, by only allowing the cleanest and most efficient stoves and boilers to qualify. In addition to the third party efficiency verification, wood stoves must emit 4.5 grams per hour or less, pellet stoves 2.5 g/hr or less, and outdoor wood boilers 0.32 lbs/mmBTU or less. (bb) has particulate emissions of less than 4.5 grams per hour for wood stoves, 2.5 grams per hour for pellet stoves, and less than 0.32 lbs/mmBTU for outdoor furnaces and boilers. (G) $500 for a wood or pellet stove that has a heating capacity of at least 28,000 Btu per hour (using the higher number from the EPA list of Certified Wood Stoves) and meets all of the requirements of subsection (b)(8)(v) except for the requirements in paragraph (I), subparagraphs (aa) and (bb). Important: This is a summary of key provisions in the bill passed by the House. Senate language is slightly different and final language could change. The DOE will issue final clarification on these issues. Start date: Once the bill is passed into law, the DOE is supposed to finalize all details within 30 days. Potentially, homes could start participating in the fall. Third party testing: Unlike the federal tax credit, which allowed manufactures to certify that their products are 75% efficient, this program requires third party certification. We expect that this will mean that the appliances has been tested by one of the five EPA accredited wood stove testing facilities in North America, or a similar institution based in Europe. It is expected that the existing data that testing facilities have from emissions testing can be used to calculate efficiency, so that stoves do not need to be tested again. 75% of home's heating needs: For the full $1,000 rebate, the stove or boiler must be able to meet 75% of the heating demands of a home. For stoves, this means that the program will favor larger stoves - and smaller homes. Heat distribution system: Unless the home is small enough for the heat of the stove reach most or all parts, the home must have "a distribution system (such as ducts of vents)" that allows heat to reach all or most parts of the home. If the upstairs is small, a simple vent in the ceiling of the room where the stove is located may suffice. Or, in a smaller one-story house, doorframe fans may suffice. If the home already has a forced air furnace, the fan function using the existing ductwork to distribute warm air throughout the house may suffice. Replacement requirement:To receive the $1,000 or $500 rebate for wood stoves, you must replace an existing wood stoves, but the rebates area available for pellet stoves without any replacement requirement. This had become the most controversial part of the bill when it required that pellet stoves also be part of a replacement program. That requirement was dropped so first time stove buyers can get the rebate for pellet stoves without trading in any biomass appliance. Installation: The appliance must be installed by a "qualified contractor" who meets certain standards included being licensed, bonded and will warranty their work is free of defects.